Get a FREE eBook on social media marketing when you purchase this book! Use these proven marketing strategies to monotize your Instagram account today! Today only, get this Amazon bestseller for just $ 0.99. Regularly priced at $ 2.99. Read on your PC, Mac, smart phone, tablet or Kindle device. You're about to discover how to turn to hobby into a powerful tool for generating passive income. If you have ever looked at the people in your Instagram feed and thought "how do they do it", then listen up! We are going to share with you proven marketing strategies that will enhance your following and turn your Instagram account into an influential powerhouse. Instagram currently has over 1 billion followers and is quickly becoming the most dominant social media platform and if your business is not on Instagram then you are missing out! By growing your influence on Instagram, you can quickly generate leads and turn those leads into sales. And the best part is that you can easily target your following. With Instagram, you can create a niche and you will quickly find that there will be like people who want to interact and engage with your content. This book will teach you what you need to know in order to become an influencer or to just grow your following and engagement! So what are you waiting for? 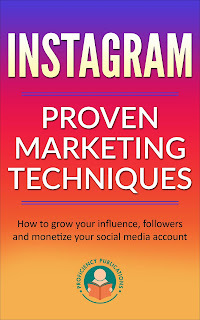 Take action today and download this book for a limited time discount of only $ 0.99 and start your journey towards monetizing your instagram account and earning passive income!